Seit einigen Monaten bin ich beim WoGE-Suchen (Um was es dabei geht, steht weiter unten. Vergangene WoGEs sammelt Felix Bossert auf seinem Blog und Ron Schott in einer KML-Datei.) nicht so recht vorangekommen – entweder kam ich nicht dazu, oder ich hab das aktuelle Blog (und den gesuchten Ort) nicht gefunden. Inzwischen bin ich hoffentlich wieder am Ball. Ole versuchte, die zeitweilig recht flotte Abfolge von Lösungen und neuen Rätseln etwas abzubremsen, indem er mit seinem WoGE #268 einen deutlich größeren Maßstab wählte als die meisten bisherigen Spieler. Das scheint geklappt zu haben, zumindest haben sich die Leute eine ziemliche Weile gequält. Where on Google Earth #270. Weil dieses WoGE glaub ich doch eher einfach ist, gilt Schotts Regel: frühere Gewinner müssen für jedes WoGE, das sie erraten haben, 1 Stunde mit der Antwort warten. Veröffentlicht am 24. Februar, 22:00 MEZ (21:00 UTC). That was hard! I knew from the beginning where to search, but the area is huge and everything looks similar. 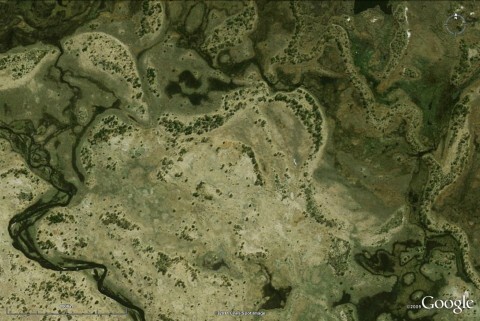 It's the Okavango delta (19°25'57"N 23°26'23"E) in Botswana. This crazy, 1000 miles long river decided not flow into an ocean as normal rivers would do, but to disappear in a swamp in the Kalahari desert. The delta is almost as large as Belgium. A great place for millions of birds, fishes, crocodiles, and hippos. It's estimated that 11km³ of water reach the delta per year. This should lead to an increase of the salt content and to a rapid salinization of the entire area, but that doesn't happen. Luckily, most of the water is not evaporated but transpirated by the plants, so the salt concentrates at their roots and on the islands. Additionally, the floodings occur periodically, so there's time for the soils to regenerate. The river is controlled by faults (Gomare, Kunyere and Thamalakane) that act as natural dams and force the water to flow in the deserts. It's estimated that the Thamalakane fault is active since 2 ma. I thought that recognising that it's in the Okavango delta would take a bit longer. Of course the area is huge, but I tried to choose a spot that would offer a bit of help. The image suggests a WNW-ESE trending border between moist and dry areas, so the location would be on the south border of one of the big branches. And there's the isolated river course in the SW.
WoGE 271 will be at http://www.paleoseismicity.org/ on Monday evening. Felix, just have a try at the old WoGEs. I did this when I first came across the game. I'm going to try my luck here. Christoph has published WoGE #271 on his blog.